A current department head had been officially admonished by his former university for allegations of sexual harassment and was named in a civil lawsuit prior to his hiring at Drexel; some officials involved in the hiring process have confirmed that they did not know. Robert Kane was hired by Drexel University in 2012 as director of the criminal justice program, and he currently heads the Department of Criminology and Justice Studies. In May 2011, when he was employed by Arizona State University, a graduate student studying under him filed a civil suit against ASU in which he was named as a defendant. In court documents from the lawsuit, the student alleges multiple instances of unwanted and inappropriate comments of a sexual nature and instances of misconduct at a conference. The civil suit was dismissed after the Arizona Board of Regents, which oversees the public university system in Arizona, settled with the student for $100,000, according to an article by azcentral. As a settlement was reached and the case was dismissed, no judgement was made as to the validity of all the allegations presented. Following the civil suit and settlement, ASU took official disciplinary action against Kane, stating that his behavior was contrary to multiple university policies regarding sexual harassment and non-retaliation, and consequently restricted his ability to mentor students and travel to conferences. “[The student] alleged that you sexually harassed her between August 2008 and February 2009, at which time when she complained to [your supervisor] and he removed her from your supervision. While some of [the student’s] allegations were unfounded, a review of your conduct reveals that you exercised extremely poor judgement in your communications and interactions with her,” Frederick C. Corey, vice provost for undergraduate education of ASU at the time, wrote in a August 2011 letter to Kane. Shortly after the official disciplinary action — though the exact timeline is unclear — Kane left ASU, joining Drexel in 2012. Members of the faculty hiring committee are given the responsibility of identifying candidates, screening applications, performing interviews with candidates and conducting some reference checks, according to the Handbook for Faculty Recruitment. They are suggested to determine whether a candidate for a department leadership position is committed to goals of diversity and inclusion. “If the candidate will assume a leadership role (division chief, department chair, etc. ), examine the candidate’s commitment to goals of diversity and gender equity, as well as the candidate’s history of mentoring women and underrepresented minority faculty,” the “Managing Interviews” section of the Handbook for Faculty Recruitment reads. A member of Kane’s faculty hiring committee, Robert Stokes, stated that he had no knowledge of these allegations at the time of Kane’s hiring. “I did not know about the allegations or the settlement prior to or during the hiring process. Nor did I know anything about this during the two years I worked with Robert Kane at Drexel. In fact, I learned about this just recently after I was contacted by the Triangle for comment,” Stokes, a former associate director of the Center for Public Policy at Drexel and now director of the School of Public Service at DePaul University, said. For Kane, however, the only two realistic ways that the sexual harassment charges could be uncovered by the faculty hiring committee are in the circumstance that references — provided by Kane — revealed this information to members of the hiring committee, or committee members were somehow able to find the Maricopa County Superior Court records. The records should have been publicly available in May 2011, detailing the allegations against Kane as laid out by the student. It is still unclear how Kane was recruited as a candidate for the position. The faculty hiring committee’s role was not to perform an in-depth review of past conduct, but human resources, which performs background investigations on all candidates, should identify past misconduct, according to the Handbook for Faculty Recruitment. The provost, which was Mark Greenberg at the time, approves recommendations from the dean. “Robert Kane was hired in 2012 as program director of criminal justice. I was Provost of Drexel at the time. As is customary, hires at that level are handled by the hiring department with oversight from the dean of the college. The dean recommends successful candidates to the provost’s office and is responsible for reviewing academic credentials, for ascertaining the suitability of a candidate for the position, and for obtaining a criminal background check. The recommendation of the dean, which was accepted, should have included that level of review. Based upon the dean’s recommendation, Mr. Kane’s hiring was approved,” Greenberg said. “I had no knowledge of any of the events at ASU that you mentioned,” he continued. Donna Murasko, current dean of the College of Arts and Sciences, was dean at the time of Kane’s hiring. Drexel performs criminal background checks on all candidates after an offer is made. The university confirmed that it performed this criminal background check in a statement. “Robert Kane, PhD, has been employed by Drexel University since August 2012 as a professor and director of the criminology and justice studies program. The University conducts backgrounds checks on all prospective employees and Kane’s background check was cleared of any criminal misconduct,” the first part of the statement reads. However, sexual misconduct is not completely covered under criminal law. Some forms of sexual harassment are violations of legislation like Title VII of the Civil Rights Act of 1964 and are only admissible in civil court. Therefore, criminal background checks don’t capture these forms of sexual harassment; only civil background checks would uncover them. Drexel has confirmed that civil litigation is not included in the background checks. 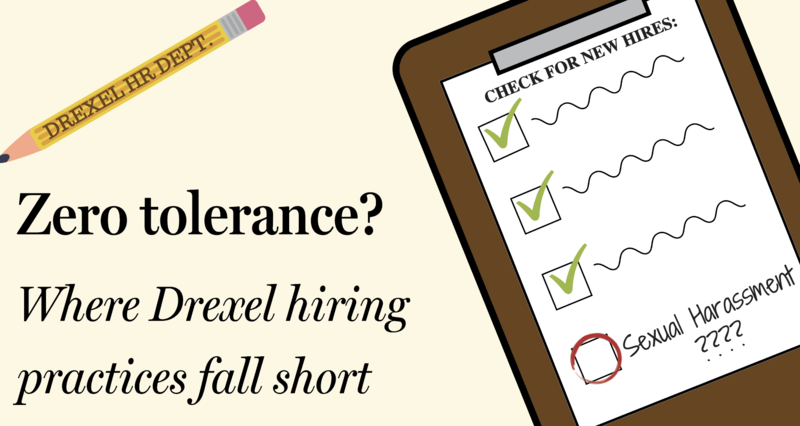 “While civil litigation checks are not part of background investigations, Drexel’s Office of Equality and Diversity and Department of Human Resources may conduct additional investigations related to employee personal conduct at any time after they have been hired if a report of misconduct has been made,” a Drexel statement to The Triangle reads. The university has not provided confirmation as to when an offer was made to Kane for the position or when his background check was conducted. In their statement to The Triangle, the university indicated that due to privacy regulations, they cannot comment on personnel matters, but provided the following information. “Background checks may include verification of information provided on the completed application for employment, resume or on other documents used in the hiring process. Human Resources determines the scope and extent of the background investigation based upon position, job responsibilities and/or activities the individual will perform as an employee. At minimum, a criminal history check in the state where the person resides or previously resided is conducted. In addition, background checks may include any or all of the following: verification of Social Security number, current and prior employment verification, professional license verification, education verification, child or elder abuse registry, reference checks, drug and alcohol screening, sexual offender registry, motor vehicle record, credit history check, pre-employment drug screening, psychological and physical examinations, name/alias check and an FBI criminal check,” part of the statement read. Although Drexel doesn’t include investigations into county and federal civil records in their background checks, several background screening companies offer services that investigate filings at both county and federal court levels. And yet, by their own admission, Drexel does not perform these civil checks. It is yet unclear what action, if any, Drexel will take in response to these facts, though they reiterated their zero-tolerance policy for sexual harassment in their statement following The Triangle’s request for comment. “Drexel is not aware of any inappropriate or unprofessional conduct by Kane since he has been employed by the university. Drexel seeks to foster a safe and healthy environment based on trust and respect and has a zero-tolerance policy concerning any and all forms of sexual harassment and misconduct,” the final paragraph of the statement reads. The allegations against Kane are described in more detail in an article by azcentral. The university’s statement in its entirety is copied below. The Department of Human Resources performs background investigations for all new hires as a condition of employment after the offer is made. Background checks may include verification of information provided on the completed application for employment, résumé or on other documents used in the hiring process. Human Resources determines the scope and extent of the background investigation based upon position, job responsibilities and/or activities the individual will perform as an employee. At minimum, a criminal history check in the state where the person resides or previously resided is conducted. In addition, background checks may include any or all of the following: verification of Social Security number, current and prior employment verification, professional license verification, education verification, child or elder abuse registry, reference checks, drug and alcohol screening, sexual offender registry, motor vehicle record, credit history check, pre-employment drug screening, psychological and physical examinations, name/alias check and an FBI criminal check. If negative information is obtained in a background investigation, it will be reviewed by an appointed committee and discussed with the supervisor to determine what employment actions are needed. While civil litigation checks are not part of background investigations, Drexel’s Office of Equality and Diversity and Department of Human Resources may conduct additional investigations related to employee personal conduct at any time after they have been hired if a report of misconduct has been made. However, the University is not aware of any inappropriate or unprofessional conduct by Dr. Kane since he has been employed at Drexel. The University has a zero-tolerance policy concerning any and all forms of sexual harassment and misconduct on its campus. The application of this policy is intended to ensure the safety of the Drexel community and it guides all recommendations made by the Office of Equality and Diversity and the Department of Human Resources.